DC's, HC's, and GM's look at tape before they sign someone, don't they? Worst player - Curtis Riley or C.C. Brown?? CC Brown. His name should be unmentionable on this site. Watching him play hurt my eyes. I hope we play the Raiders this yr.
Mahomes throws for record 729 yards in win against Raiders. Wasn't he a draftnik more so than a free agency guy? Played all 16 games, way up there in tackles and a bunch of turnovers. by not evening attempting to tackle Barwin worked out for him. Since that was his last play in a Giants uniform, it sums up his career here pretty well. I don't think Mayock has much say over the roster. Reggie McKenzie was an experienced GM and he had no say once Gruden got there. Highly doubt Mayock does. CC Brown was probably the worst back-end defensive player to have worn a Giants uniform in my lifetime. And I'm 60 years old. This is why statistics don't mean squat. Pretty sure Riley led all free agent safeties with 4 INT's last year. Raider fans probably think they're getting a decent player looking at that stat line. "New York Giants� Curtis Riley would likely hope to forget his tackling performance in 2018. The fourth-year Fresno State product missed a position-high 23 tackles across his 988 defensive snaps this past season, giving him the lowest tackling efficiency (3.9) among the 74 NFL safeties." title here. 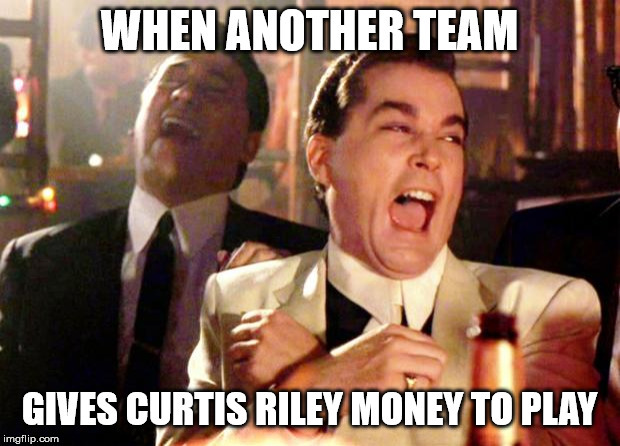 I think it echoes a lot of our feelings on Curtis Riley. RE: RE: RE: Toss up!! He took a bad route to the meeting and was quite late. This is part of their tank plan for the number one pick next year. They�ve got to compete with the Dolphins, so they need to lower the bar. today just is not my flipping day!! would have signed him 3/40 million or something like that. I never thought I would see a starting safety as bad as CC Brown but then we got Curtis Riley. And simultaneously, a tree fell in a forest.